George Wythe was among the most respected Virginians during the late 18th century. Wythe had a brilliant legal mind and was a man of integrity. He was important as a revolutionary, but even more so as an educator. Many of his best students became revolutionaries themselves, and two even became President of the Unites States. George Wythe was a senior member of the American Revolution. By the outbreak of the war, Wythe had been serving the Colonial Government in Virginia for close to 30 years. He played supporting roles in both the Pistole Fee Controversy and John Robinson Scandal during the two decades leading to rebellion. Throughout this time he made a fortune growing his legal practice and gained fame for his intellect and honesty. Wythe found himself siding with the growing resistance movement in the colonies. He sponsored a resolution in Virginia which declared a day of fasting and prayer. The goal was to represent solidarity with the people of Boston, who were suffering the worst hardships due to the new laws. This decision led to the Royal Governor's dissolution of the House of Burgesses, in essence eliminating any participation the people of Virginia had in their government. In retaliation, the Burgesses set up the Virginia Convention, which became the de facto government of the colony. It would continue as such until independence was declared and a new state constitution written. When George Washington was selected as Commander in Chief of the Continental Army in 1775, he left the Continental Congress. The man chosen to replace him was George Wythe. Wythe voted for independence the following year, but was not in Philadelphia when the signing took place (he had returned home to help create his State's new government). Knowing he would return soon, his fellow Virginians left space at the top of their section so that his name might appear first, such was the respect they had for him. After working in the State government throughout the Revolutionary War, George Wythe was elected as a representative to the Constitutional Convention. Unfortunately, he had to leave early in the proceedings as his wife was sick and needed his attention. When the Virginia Ratification Convention began, Wythe was chosen as Chairman of the Committee of the Whole. Though not President of the body, his position had him running the floor for most of the debates. He was the most powerful officer in the room during his time as Chairman, however, any decisions made were nonbinding. Only when he stepped down from the podium (and President Edmund Pendleton stepped up) did votes count. On the final day of the Convention, Wythe adjourned the Committee of the Whole and left the silence of moderator behind him. George immediately gave an impassioned speech regarding the necessity of this new government. When the 168 representatives meeting that day voted, the United States Constitution was passed...by just 10 votes! Virginia, as the largest and most powerful State, was needed to legitimize the federal government. George Wythe’s last minute speech may have swayed the last few undecided voters to support a united nation. Perhaps the greatest gift George Wythe gave to the American Revolution was the revolutionaries themselves. Back When he was 35 years old, George was persuaded to take on a brilliant young law student as an apprentice. This teenager's name was Thomas Jefferson. Eventually, Wythe became a professor of law at the College of William and Mary. During his years as an educator, he established many learning traditions we still use today, most notably the use of mock trials. Among Wythe’ students were notable Americans such as Jefferson, James Monroe, John Marshall, Bushrod Washington, St. George Tucker, Henry Clay, John Breckenridge, Spencer Roane, and Littleton Waller Tazewell. Some of these are among the most important names in the creation of the new United States. As always, this is just a brief overview of an extraordinary life. Actually, perhaps the most interesting thing about George Wythe was his death (I'm considering writing an article about just that in the near future). To keep up with our daily Founders, please think about subscribing to our email list. We'll get a Founder of the Day to your inbox and will not give your private information to anyone else. Instead of the usual one book recommendenation, today I am giving two options about Wythe. 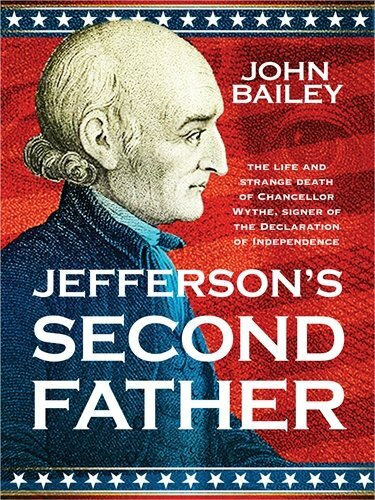 The first is 'Jefferson's Second Father' which is a standard biogrophy. 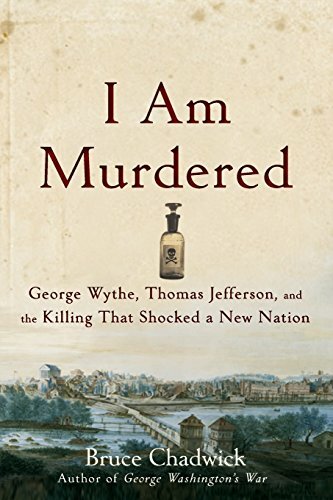 The second is 'I Am Murdered,' a story that focuses on Wythe's strange death and it's effect on the Jefferson Presidency. Our books are purchased through Amazon and, while we get a small commission, your price does not change.